The compact, very affordable point and shoot camcorder is a dying breed, due to the advances in smartphone camera technology. But Panasonic are giving this market another try, while also pushing the boundaries of anything we’ve seen within it previously. The camcorder is called the Panasonic HX-WA2, it features a waterproof design, a 14 Mega Pixel sensor that’s taken advantage of by still images and is capable of full HD 1/2.33in CMOS video recording. 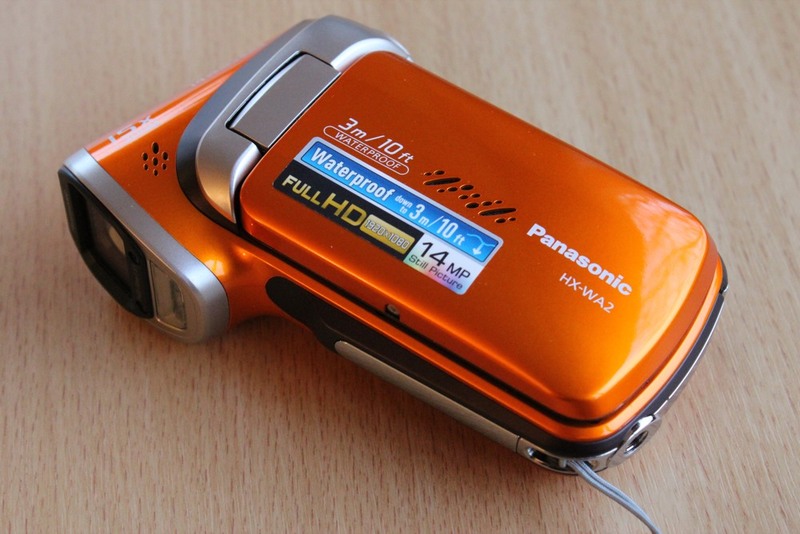 Beginning with the design, the camcorder comes in two colours, metallic orange and blue. I have the orange and the glossy shade is very pleasing on the eye and doesn’t pick up fingerprints. To operate the camcorder a button grill is located on the top rear. It allows for photo and video capturing, the buttons in the middle of these trigger telephoto and wide angle zooming. Panasonic claim that the HX-WA2 has 15x i.zoom. Basically meaning you have 5x optical zoom and 10x hybrid digital zoom. Panasonic take the digital zoom and bulk the pixels creating an image more reminiscent of optical zoom. The result falls somewhere in the middle but is a very neat feature. The camcorder is held in the pistol grip fashion. It feels so comfortable and natural to use. The right hand side of the camcorder has a textured surface which helps with grip coupled with the lightness and compactness allow for a firm hold. 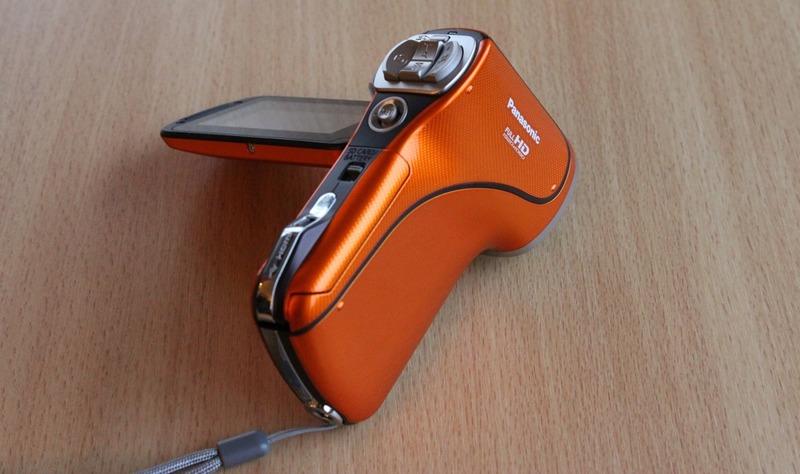 The 2.6 inch screen flips out of the camcorder and can be rotated 285 degrees. Opening it awakes the camcorder and closing it will put it to sleep. Surprisingly a small amount of internal storage is included, enough to store around 15 seconds of footage. So you’re going to need an SD card. Operating the cameras menu system isn’t in anyway intuitive. It gets the job done but the average consumer will find themselves infrequently adjusting settings. The buttons are a little small and are easily miss pressed. I shoot, shut and sync with my Mac. And the HX-WA2 fits this type of usage perfectly. I have tested video quality extensively over the past two weeks, both indoors and outdoors. To generalize it performs well, delivering high quality video. The camcorder is at it’s best in well lit environments, picking up crisp colours and notably consistent frame rates. The sensor captures motion extremely well, plus face detection is built in. Image stabilisation isn't optical, instead electronic and the difference is very notable unfortunately. Zooming is smooth and the auto focus (can change to manual) works efficiently, but when very zoomed, it waffles. Low light recording is terrible, it’s not presentable and the camcorder just severely lags with an intolerable amount of noise. It’s an everyday sort of device, it’s not terrible quality but it’s not high end either, it sits firmly in the middle. Still photos can be taken, a feature many pocket camcorders don't include. I dabbled with photography on the HX-WA2 far less than the video. From what I’ve seen, it performs well, delivering quite sharp accurate colours. Plus a built in flash lends a very good hand in those low light scenarios. One of my favourite features of this products is panoramic mode, allowing for vertical and landscape merging of photos which delivers a 360 degree view point. Brilliant for vast views. Durability is an interesting one, it’s waterproof up to 3 meters/ 10 feet. It works but the included fabric wrist strap takes ages to dry off, while the water on the camcorders plastic body will drip off within 30 seconds. This is slight design flaw. However it’s always fun to take photos in water and get creative with the substance. In terms of how it holds up to drops, I am uncertain on, it’s not shock proof but the body is coated in a very rugged plastic. So should you purchase the Panasonic HX-WA2? Well if you already have fantastic video and still image capturing from your smartphone, no. But if you don’t own a smartphone and want something that can fit in your pocket and that within an instant can be capturing, while hosting many other features, it could definitely be a very nice option.